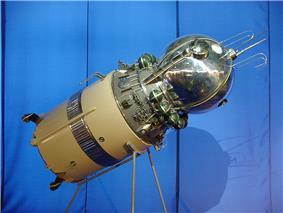 Vostok 1 (Russian: Восто́к-1, East 1 or Orient 1) was the first spaceflight of the Vostok program and the first human spaceflight in history. The Vostok 3KA spacecraft was launched on April 12, 1961 with Soviet cosmonaut Yuri Gagarin, making him the first human to cross into outer space. The spaceflight consisted of one orbit around Earth, the shortest manned orbital flight to date. According to official records, the spaceflight took 108 minutes from launch to landing. As planned, Gagarin parachuted to the ground separately from his spacecraft after ejecting at 7 km (23,000 ft) altitude. Due to the secrecy surrounding the Soviet space program at the time, many details of the spaceflight only came to light years later, and several details in the original press releases turned out to be false. The world's first artificial satellite, Sputnik 1, had been put into orbit by the Soviet Union in 1957. This event could be considered the beginning of the Space Race between the Soviet Union and the United States, the two Cold War superpowers. Both nations wanted to develop their spaceflight technology quickly, and in particular, both wanted to be the first to launch a successful human spaceflight. The Soviet programme for doing this was the Vostok programme. Prior to a manned spaceflight, the Soviets launched several precursor unmanned missions between May 1960 and March 1961, to test and develop the Vostok rocket and Vostok spacecraft technology. These missions had varied success, but the final two unmanned missions—Korabl-Sputnik 4 and Korabl-Sputnik 5—were outright successes, opening the door for a manned flight. The final decision of who would fly the mission relied heavily on the opinion of Nikolai Kamanin. In an April 5 diary entry, Kamanin wrote that he was still undecided between Gagarin and Titov. He wrote: "The only thing that keeps me from picking [Titov] is the need to have the stronger person for the one day flight." Kamanin was referring to the second mission, Vostok 2, which would last a full day, compared to the relatively short single-orbit mission of Vostok 1. When Gagarin and Titov were informed of the decision during a meeting on April 9, Gagarin was very happy, and Titov was disappointed. On April 10, this meeting was reenacted in front of television cameras, so there would be official footage of the event. This included an acceptance speech by Gagarin. As an indication of the level of secrecy involved, one of the other cosmonaut candidates, Alexey Leonov, later recalled that he did not know who was chosen for the mission until after the spaceflight had begun. Gagarin was examined by a team of doctors prior to his flight. One doctor gave her recollection of the events in an interview with RT in April 2011: "Gagarin looked more pale than usual. He was unsociable and quiet, which was not like him at all. He would answer by nodding or a short 'yes' to all questions. Sometimes he would start humming some tunes. This was a different Gagarin. We geared him up, and hugged. And I said, "Yuri, everything will be fine." And he nodded back." Electrocardiogram of Gagarin recorded April 11, 1961, at 19 hours and 35 minutes. 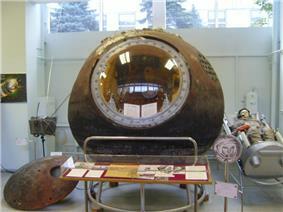 Exhibited at the Memorial Museum of Astronautics in Moscow. On Baikonur cosmodrome on the morning of April 11, 1961, the Vostok-K rocket, together with the attached Vostok 3KA spacecraft, were transported several miles to the launch pad, in a horizontal position. Once they arrived at the launch pad, Sergei Korolev inspected the rocket and spacecraft for problems, and without finding any, the rocket was raised into the upright position. At 10 am (Moscow Time), Gagarin and Titov were given a final review of the flight plan. They were informed that launch was scheduled to occur the following day, at 9:07 am Moscow Time. This time was chosen so that when the spacecraft started to fly over Africa, which was when the retrorockets would need to fire for reentry, the solar illumination would be ideal for the orientation system's sensors. 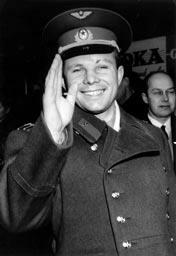 At 5:30 am Moscow time, on the morning of April 12, 1961, both Gagarin and his backup Titov were woken. They were given breakfast, assisted into their spacesuits, and then were transported to the launch pad. Gagarin entered the Vostok 1 spacecraft, and at 7:10 am local time (04:10 UT), the radio communication system was turned on. 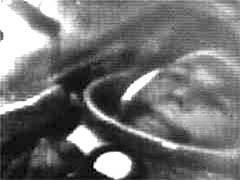 Once Gagarin was in the Vostok 1 spacecraft, his picture appeared on television screens in the launch control room from an onboard camera. Launch would not occur for another two hours, and during the time Gagarin chatted with the mission's main CapCom, as well as Chief Designer Sergei Korolev, Nikolai Kamanin, and a few others. Following a series of tests and checks, about forty minutes after Gagarin entered the spacecraft, its hatch was closed. Gagarin, however, complained that the hatch was not sealed properly, and technicians spent nearly an hour removing all the screws and sealing the hatch again. According to a recent obituary, Vostok's chief designer, Oleg Ivanovsky, personally helped rebolt the hatch. There is some disagreement over whether the hatch was, in fact, not sealed correctly as a more recent account stated the indication was false. During this time Gagarin requested some music to be played over the radio. Sergei Korolev was very nervous in the lead up to the launch; he experienced chest pains, and took a pill to calm his heart. Gagarin, on the other hand, was described as calm; about half an hour before launch his pulse was recorded at 64 beats per minute. 06:07 UT Launch occurs from the Baikonur Cosmodrome Site No.1. Korolev radioed, "Preliminary stage..... intermediate..... main..... lift off! We wish you a good flight. Everything is all right." Gagarin replied, "Поехали! (Poyekhali - Let's go!)." 06:17 UT The Vostok rocket final stage shuts down, ten seconds later the spacecraft separates and Vostok 1 reaches orbit. (T+ 676 s) Gagarin reports, "The craft is operating normally. I can see Earth in the view port of the Vzor. Everything is proceeding as planned". Vostok 1 passes over the Soviet Union and moves on over Siberia. 06:21 UT Vostok 1 passes over the Kamchatka peninsula and out over the North Pacific Ocean. Gagarin radios, "...the lights are on on the descent mode monitor. I'm feeling fine, and I'm in good spirits. Cockpit parameters: pressure 1; humidity 65; temperature 20; pressure in the compartment 1; first automatic 155; second automatic 155; pressure in the retro-rocket system 320 atmospheres...."
06:51 UT Gagarin reports the sun-seeking attitude control system has been switched on. The sun-seeking attitude control system is used to orient Vostok 1 for retrofire. The automated orientation system consisted of two redundant systems: an automatic/solar orientation system and a manual/visual orientation system. Either system could operate the two redundant cold nitrogen gas thruster systems, each with 10 kg (22 lb) of gas. At 07:25 UT, the spacecraft's automatic systems brought it into the required attitude (orientation) for the reentry engine firing, and shortly afterwards, the engine firing occurred, also known as retrofire. This took place over the west coast of Africa, near Angola, about 8,000 km (5,000 mi) from the desired landing point. The liquid-fueled retrorockets fired for about 42 seconds. At 07:55 UT, when Vostok 1 was still 7 km from the ground, the hatch of the spacecraft was released, and two seconds later Gagarin was ejected. At 2.5 km (8,200 ft) altitude, the main parachute was deployed from the Vostok spacecraft. Two schoolgirls witnessed the Vostok landing and described the scene: "It was a huge ball, about two or three metres high. It fell, then it bounced and then it fell again. There was a huge hole where it hit the first time." Gagarin's parachute opened almost right away, and about ten minutes later, at 08:05 UT, Gagarin landed. Both he and the spacecraft landed via parachute 26 km (16 mi) south west of Engels, in the Saratov region at . It was 280 km to the west of the planned landing site (near Baikonur). When Soviet officials filled out the FAI papers to register the flight of Vostok 1, they stated that the launch site was Baykonur at . In reality, the launch site was near Tyuratam at , 250 km (160 mi) to the south west of "Baykonur". They did this to try to keep the location of the Space Center a secret. :284 In 1995, Russian and Kazakh officials renamed Tyuratam Baikonur. Vostok, the lead ship of Faddey Bellingshausen, who discovered Antarctica during the Russian expedition to the south polar region in 1819/20. Some sources connect the name Vostok 1 to Bellingshausen's ship. ^ a b c "Aviation and Space World Records". ^ "Google Maps – Vostok 1 Launch Pad – Gagarin's Start photo". Retrieved 2010-12-25. ^ "Google Maps – Vostok 1 Landing Site – Monument". Retrieved 2010-12-25. ^ "Google Maps – Vostok 1 Landing Site – Monument Photo". Retrieved 2010-12-25. ^ "Oleg Ivanovsky - obituary". Daily Telegraph. 21 September 2014. Retrieved 25 September 2014. ^ Burgess and Hall, p.151. During a post-flight press conference on April 15, Alexander Nesmeyanov claimed that Gagarin took a sleeping pill. Also, Siddiqi, p.273, claims that they were both asleep at 9:30 pm when Korolev came to visit them, but Burgess and Hall, p.151, says Korolev spoke with them at this time. ^ Siddiqi describes is as a "tranquilizer pill", while Hall and Shayler describe it as a "cardiac pill". ^ a b Руденко М. И. (May–June – 2008). "Тогда Юра вернулся на землю не из космоса, а с того света!..". интернет-газета "Русская Берёза". Retrieved 2011-03-31. ^ "UPI Radio – 1961 Year In Review". UPI Audio Network. ^ Arthur Krock, "In The Nation; Concentration of Science on Outer Space," New York Times p. 28, April 14, 1961. "But because of the distrust that now exists among the great nations, and has plunged them into huge programs of deadly rearmament, an achievement by one which carries a clear and direct potential of military supremacy engenders fear of its use.... And so it has become as impossible for either of the groups divided by the Cold War to welcome unreservedly such feats as Major Gagarin's in the opposite camp." ^ a b c d e f g h i j "Opinion of the Week: At Home and Abroad," New York Times p. E11 (April 16, 1961). Quotes of reactions from many US and international sources. ^ a b c d "Man in Space", New York Times p. E1 (April 16, 1961). ^ Harry Schwartz, "Moscow: Flight is taken as another sign that communism is the conquering wave," New York Times p. E3 (April 16, 1961). ^ "Google Maps – Vostok 1 Landing Site – Monument Park Location – Satellite photo". Retrieved 2010-12-26. 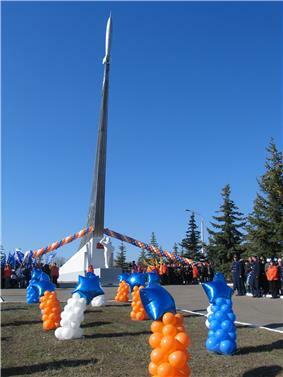 ^ "Google Maps – Vostok 1 Landing Site – Rocket Monument photo". Retrieved 2010-12-26. ^ "Google Maps – Vostok 1 Landing Site – Yuri Gagarin Statue photo". Retrieved 2010-12-26. Colin Burgess, Rex Hall (June 2, 2010). The first Soviet cosmonaut team: their lives, legacy, and historical impact. Praxis. p. 356. Rex Hall, David Shayler (May 18, 2001). The rocket men: Vostok & Voskhod, the first Soviet manned spaceflights. Springer. p. 350.